On behalf of the Texas Department of State Health Services (DSHS) Health Service Region (HSR) 9/10, we would like to invite you to High Consequence Infectious Disease Response: Ebola and Other Pathogens, a Multi-Disciplinary Workshop. 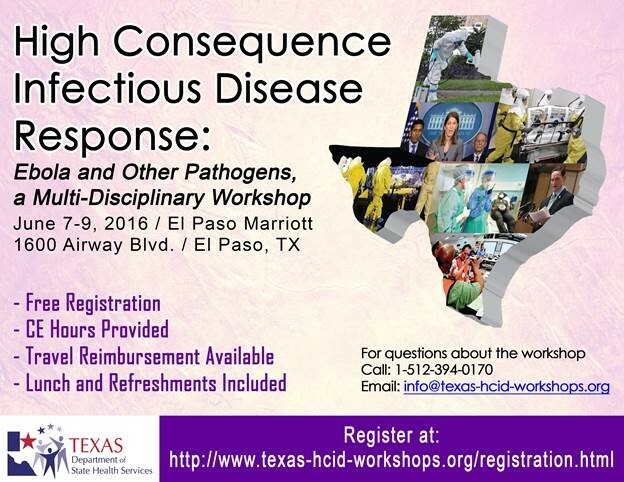 The workshop will be held at the El Paso Marriott (1600 Airway Blvd, El Paso, TX 79925) on June 7 – 9, 2016. • epidemiological investigation and other surveillance issues. A detailed agenda and description can be accessed at: http://www.texas-hcid-workshops.org/Program.html. We understand that there are great demands on your time, you have many competing priorities, and travel funds may be limited. In an effort to make your attendance more manageable, DSHS has set aside travel funds that you can apply for during registration. In addition, DSHS will be providing Continuing Education credit for multiple disciplines for this event. 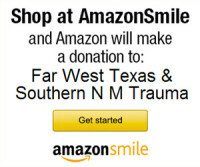 You can register online at: http://www.texas-hcid-workshops.org/registration.html. During the registration process, there is a check box that you can click to be considered for travel reimbursement (see attached print screen).